If the front foot is too close to the tip of the board, the board will skid excessively on heelside turns and traverses, and generally feel twitchy. If the front foot is mounted too far back, the board will handle like an aircraft carrier. It is better to start with more stability than hyperactivity. Take a look at the insert pattern on the board. If the board is a Burton, it will have a 3-hole pattern with a recommended reference location. 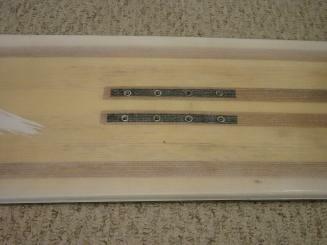 Any other board will have a 4-hole pattern, and may not have any reference markings. As a rule of thumb, do not go ahead of the reference location on a Burton, and use the rear set of hole on other boards. Of course, some 4-hole patterns have many more options than others. Generally, you want to start centered or back of center on the pattern. Set the front binding on this location, and establish the angle and offset. The foot is strong from heel to toe, and agile from side to side. You are looking for the optimal blend, to ensure intuitive balance and the ability to tilt and hold the board on edge. Initially, there is no need to exceed 25 degrees on the front foot.